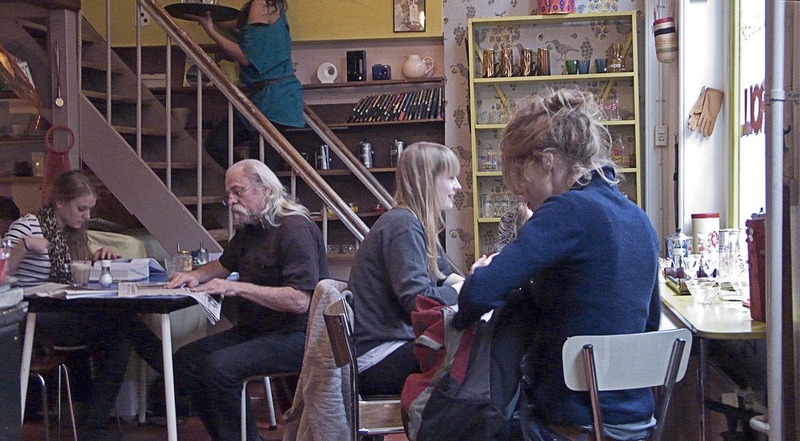 Where do the locals eat in Amsterdam? It’s not the McDonald’s or Burger King unless they have had one too many of course. 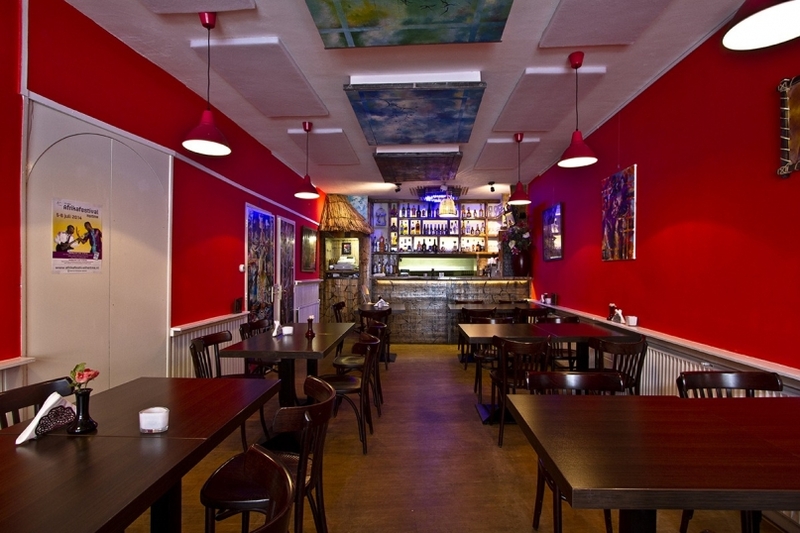 There is a great choice of places to eat in Amsterdam, but few of them are in the central touristy areas. 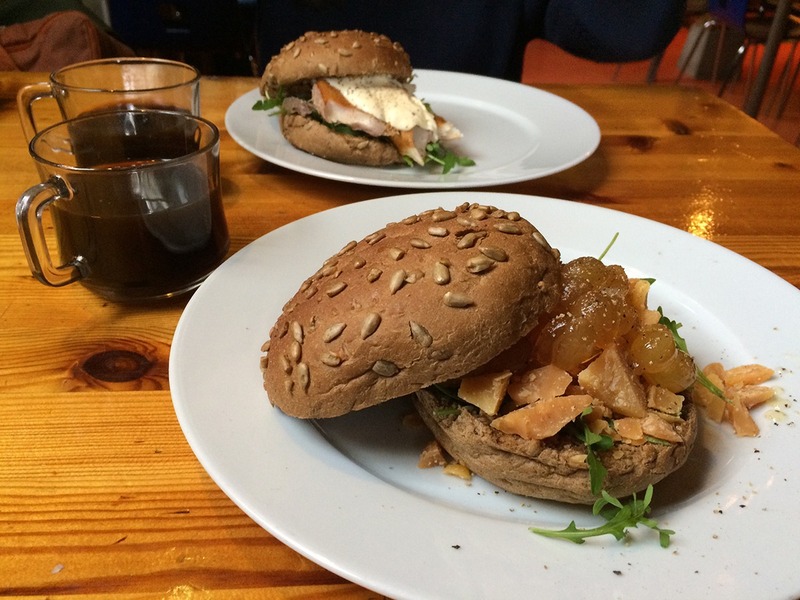 So who can help you find the best places to eat in Amsterdam? *Slowly raises hand* I can! At all these places you can eat for €10 to €15. We’re talking the main course here, usually excluding drinks or side dishes. I’ve included some lunch places too which are worth visiting. Great vibe and good service are bonus points. 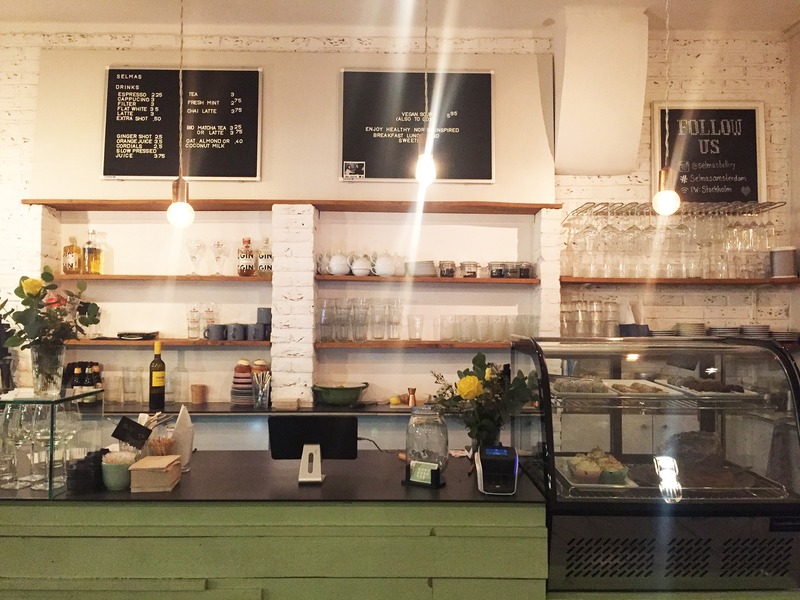 Don’t expect fancy waiters and prepped plates but instead, you’ll find creative interiors and great food. Check out this article to find out how to use the custom Google Map offline. 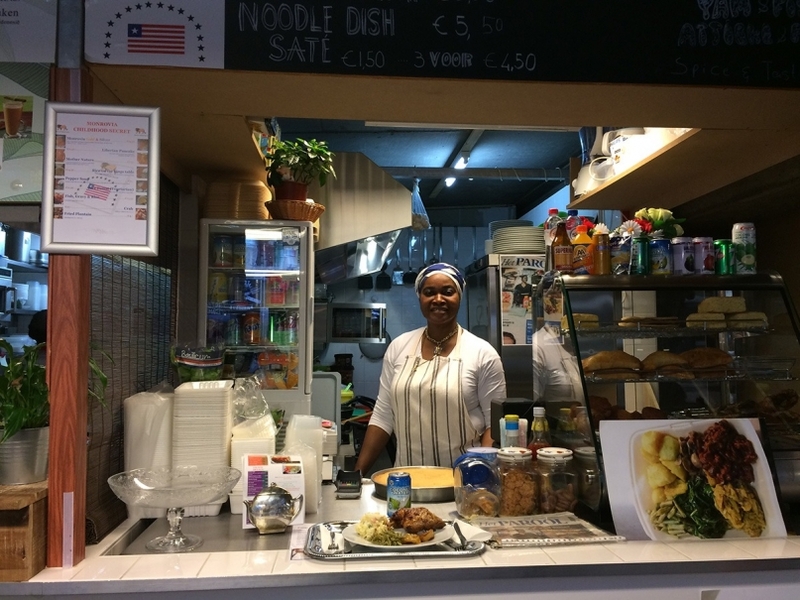 This collection of food stalls, located in the multi-cultural South-East of Amsterdam, is one of the best places to eat in Amsterdam. 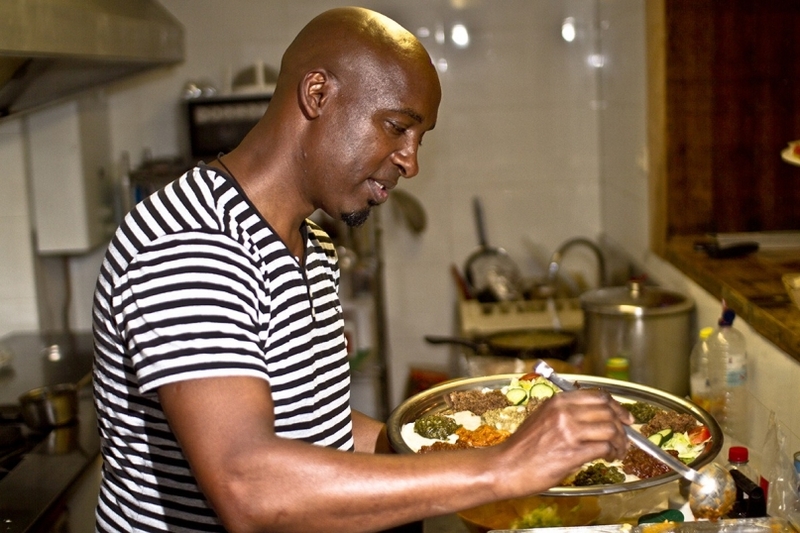 The atmosphere, cultural diversity and home-cooked food never fail to put a big smile on my face every time I visit it. The building itself used to be a parking garage, and little has been done with the interior to conceal this fact. The authentic, wide range cuisine. 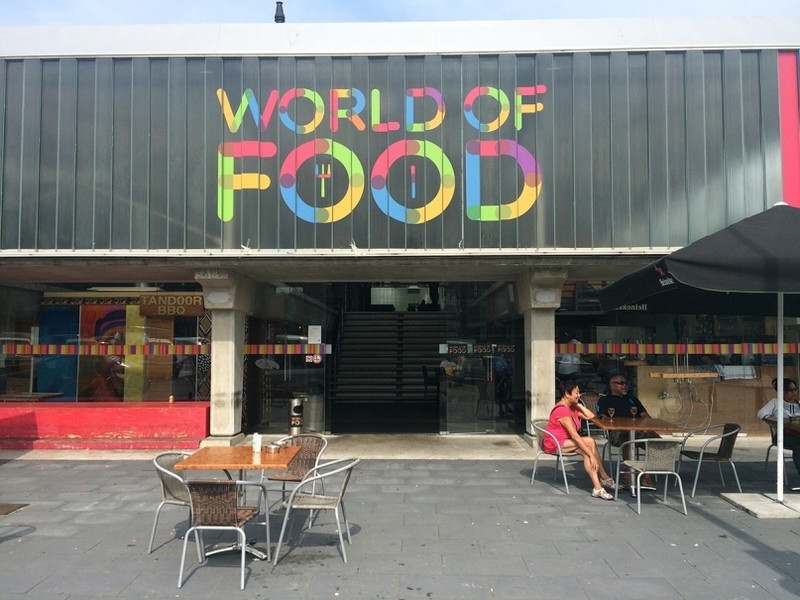 Here you will find food from all the corners of the world: Indonesian, Surinamese, the Caribbean, Indian, but also Ghanese, Liberian and Armenian. Everything you will try here tastes absolutely amazing and will make you want to come back the next day. The atmosphere. You will undoubtedly feel like you have teleported to a foreign country. 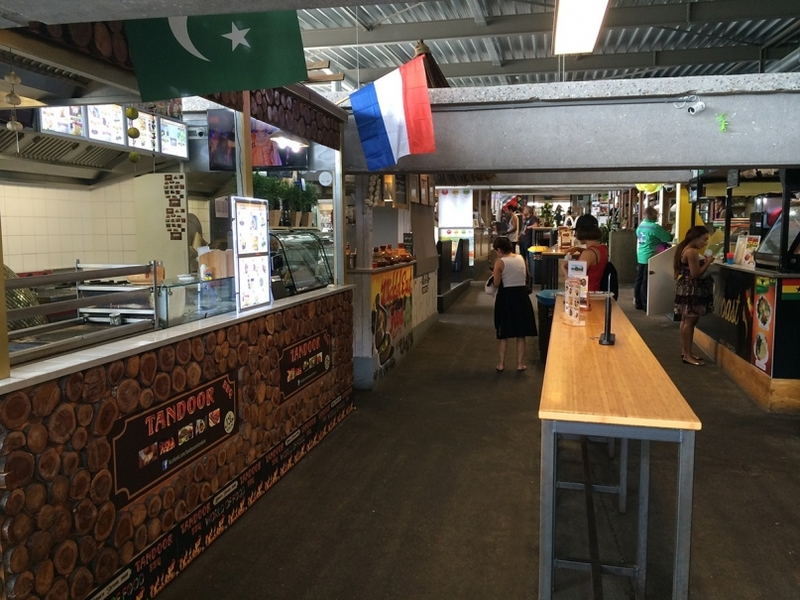 Every stall has its own attributes, music, and local chefs. As the stalls are all next to each other, this creates a beautiful labyrinth through many cultures. 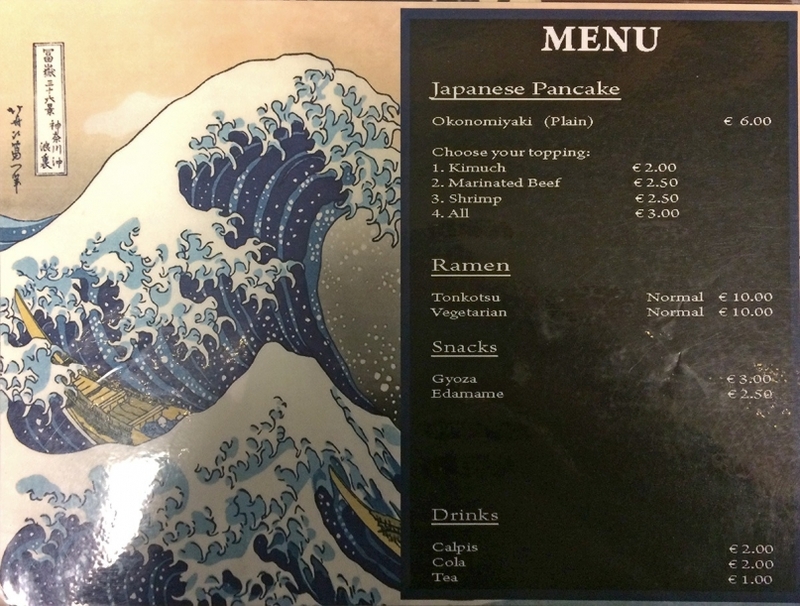 Forget slick marketing and neon well-curated signs: here you will find laminated A4 menus with pixelated iPhone photos of food. You’ve got to love it! Probably my favorite stall of them all: Hannah Collins is always smiling and prepares the nicest Liberian specialities, see below. 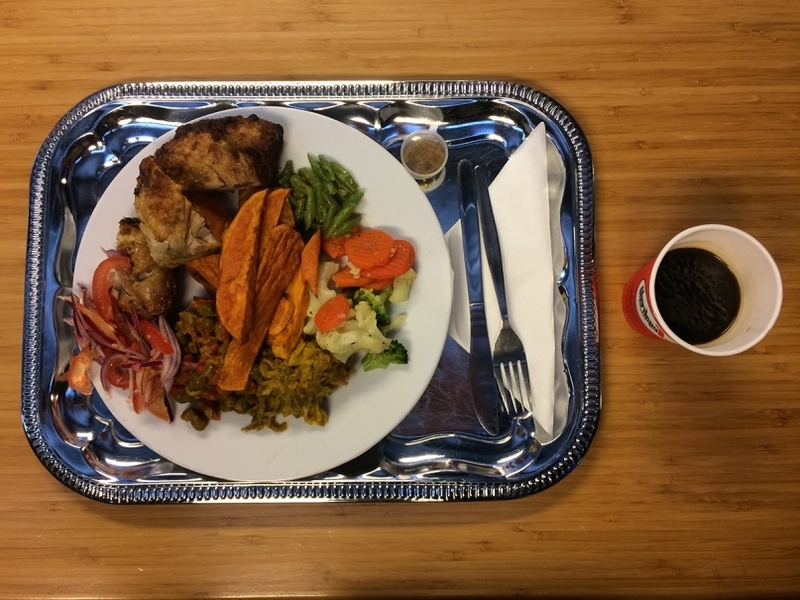 A Liberian lunch dish with sweet potato, tasty vegetables and chicken, made by Hannah Collins. Even though I am often found in the “De Pijp” neighborhood where this East African restaurant is in, I had never heard the name before. It’s because of a tip from a friend that we decided to give it a visit. We turned into an unknown side street to find its minimally decorated entrance; it would have been very easy to have walked past. The atmosphere inside the narrow, long restaurant is different. 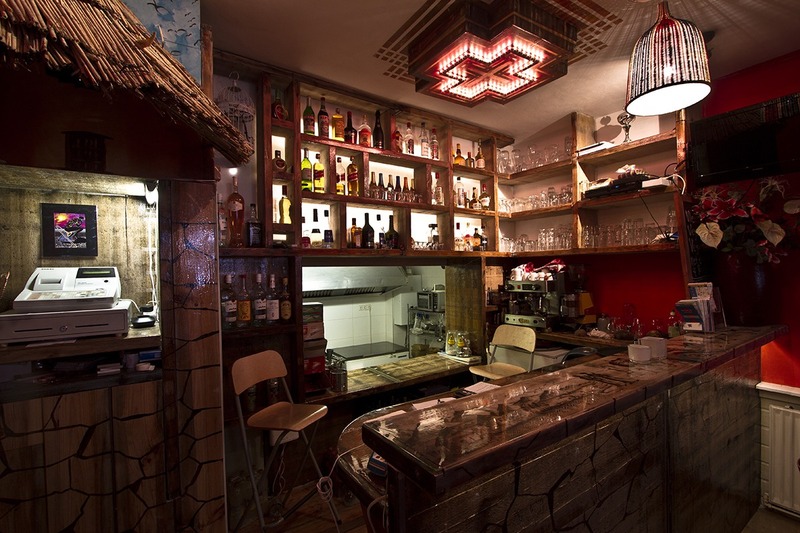 Many African-looking paintings can be found on the walls, and the themed bar makes for a fitting backdrop. 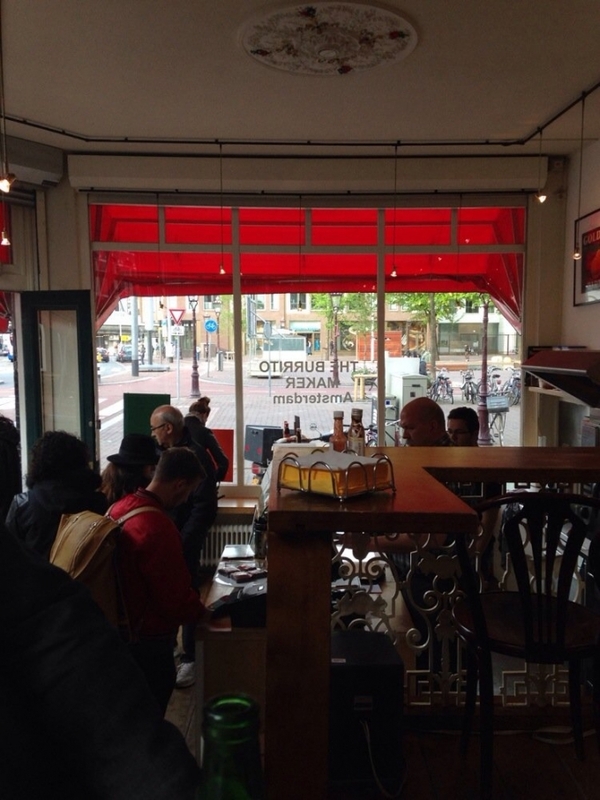 It can definitely be labeled ‘Gezellig’ (Dutch for cozy), and it is a nice counterpart to the sprawl of ‘cool’ restaurants and cafes in Amsterdam. If you like sharing your food, you’ll love this place. Your food comes on a single round metal plate, the bottom layer covered in what I can only describe as fluffy pancakes (which I learned was called Injera, a large sourdough flatbread). ‘Curries’ will be served on top, and you’ll get a few more servings of pancakes on the side. The special beers are a great addition, try the coconut and banana flavors. All very tasty and between 10 and 15 euros (for the food). There isn’t much left to the imagination with the name of this Tex-Mex burrito place in the heart of Amsterdam. That doesn’t mean however that their hand-made oversized blankets of yummy goodness aren’t absolutely delicious. Because they truly are. All the ingredients taste very fresh, and the choice of filling and chili sauce is excellent. 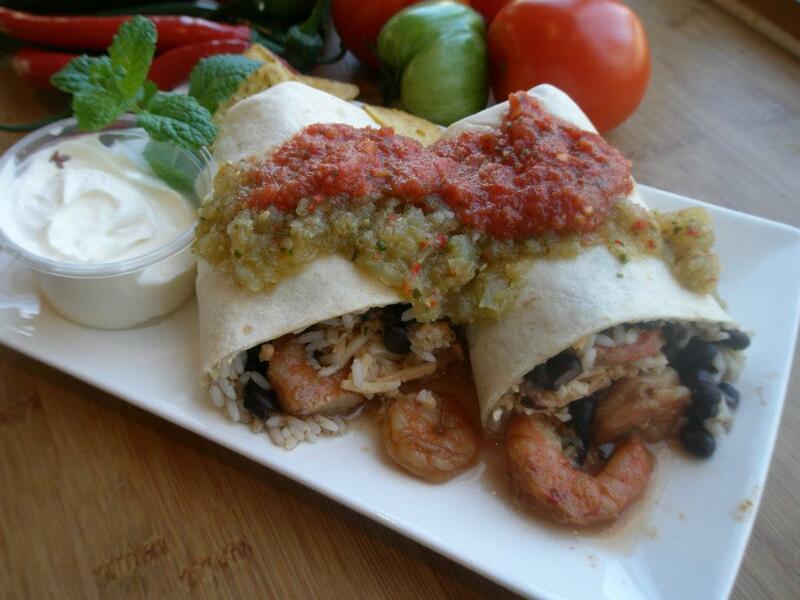 Get the chicken, avocado and bacon burrito if you don’t have any plans for the rest of the afternoon. They have a couple of seats if you want to devour your meal indoor, but it’s a great take-away location too. 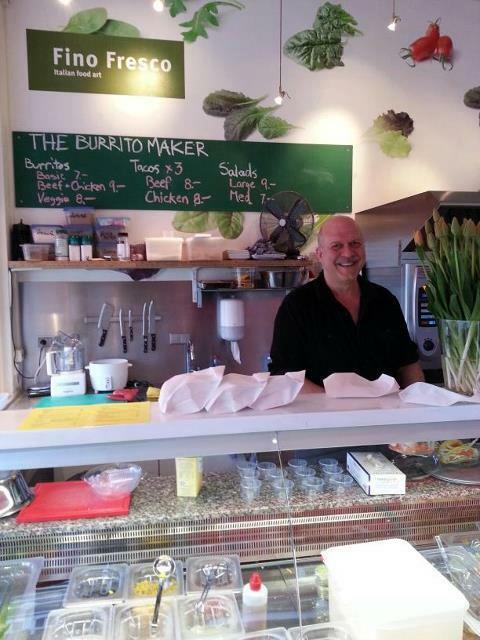 The Burritomaker at Haarlemmerplein has a nice elevated seating platform overlooking the counter / kitchen. Original picture: Yelp. I was a frequent visitor to this place even before I found out what it’s called. 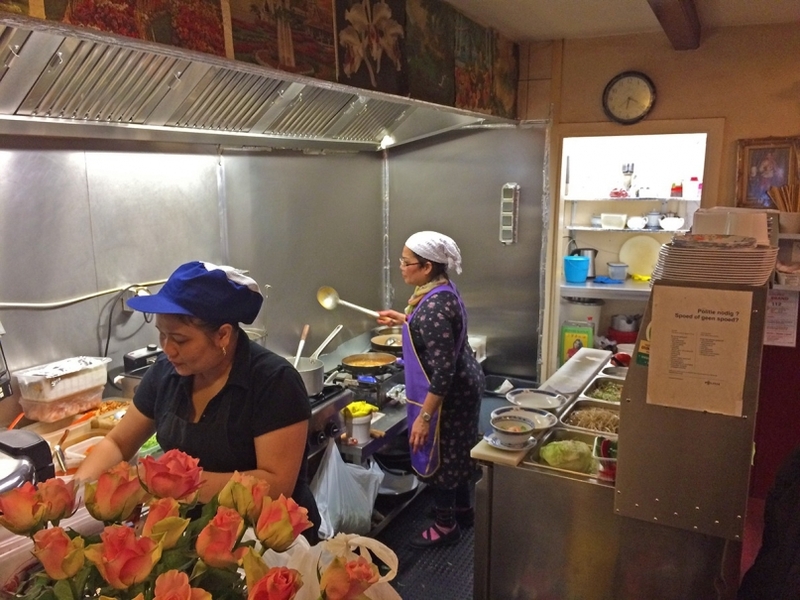 This popular place offers Surinamese/Javanese goodness done well. There are ample Surinamese take-away restaurants in Amsterdam, but not all of them get it right. Spang Makandra might not look like much from the outside; I assure you it is. 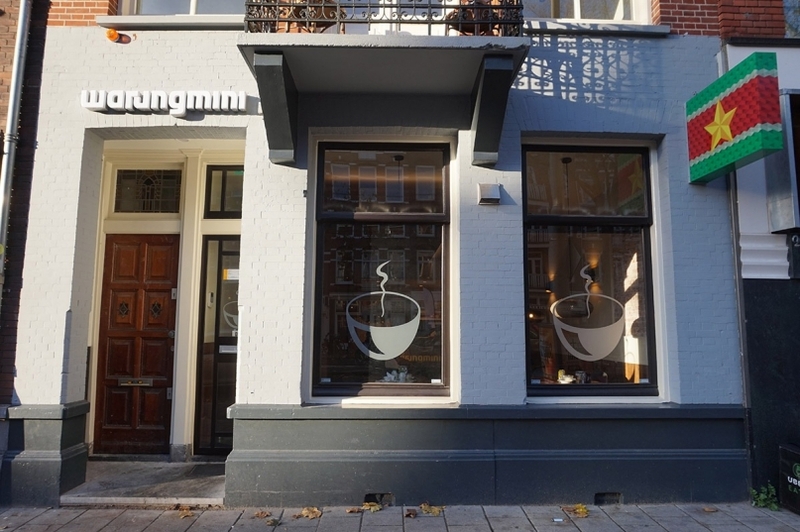 A good indication is when a restaurant has been rated highly by the late Johannes van Dam, who was a very ruthless Dutch food critic for newspaper Parool. Warung (which means ‘stall’ in Indonesian) Spang Makandra received a convincing ‘9’, even with a few positive personal comments. 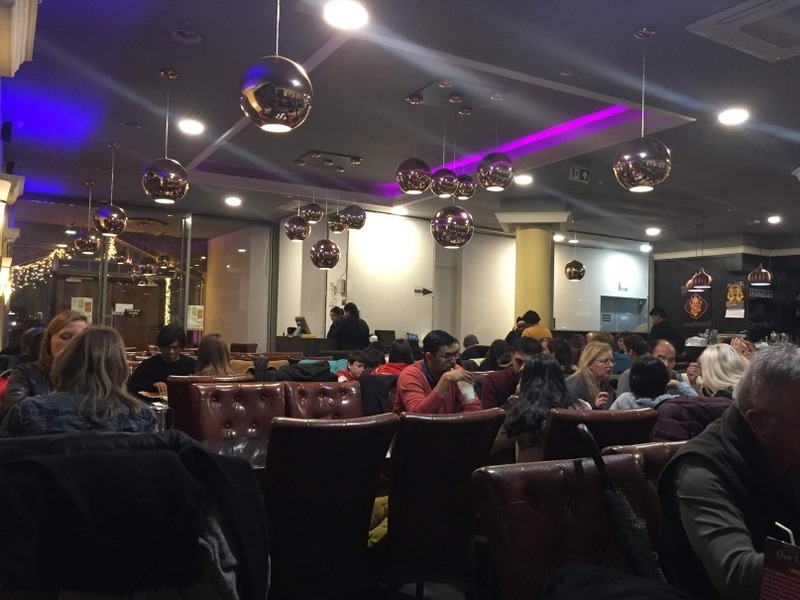 He wasn’t wrong, the food has a very good standard and is great for some quick takeaway or to eat in (it fills up quite quickly though around dinner time). Try the Saoto soup (rich soup with bean sprouts, shredded chicken filet and rice) and the kip saté (chicken skewers; the sauce is amazing!) or if you’re really hungry try the Nasi Goreng (baked rice with chicken, beef or fish) or Roti (similar to the Indian variety). 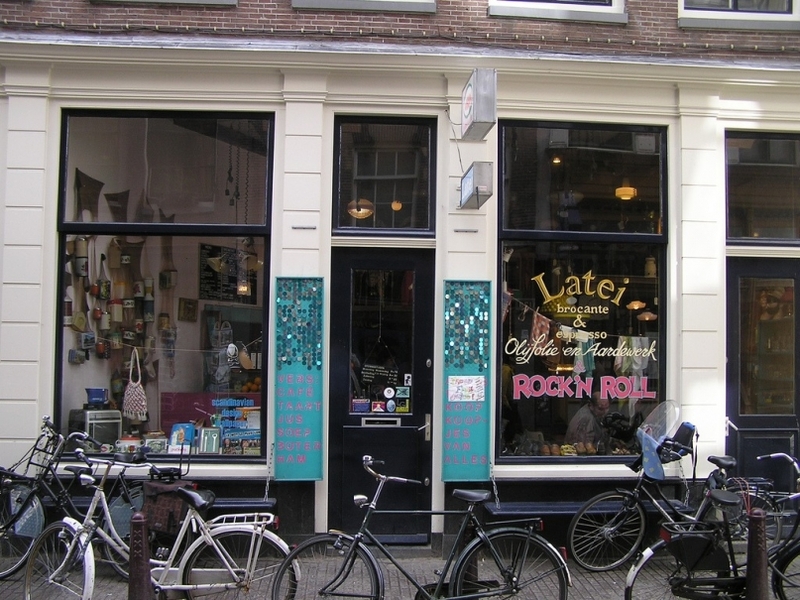 If you’re looking for a cheap place to eat in Amsterdam I recommend to schedule a pit-stop here. Spang Makandra’s special: Javaanse Rames. Rice, noodles, chicken filet, chicken kabob with peanut sauce and shrimp crackers. 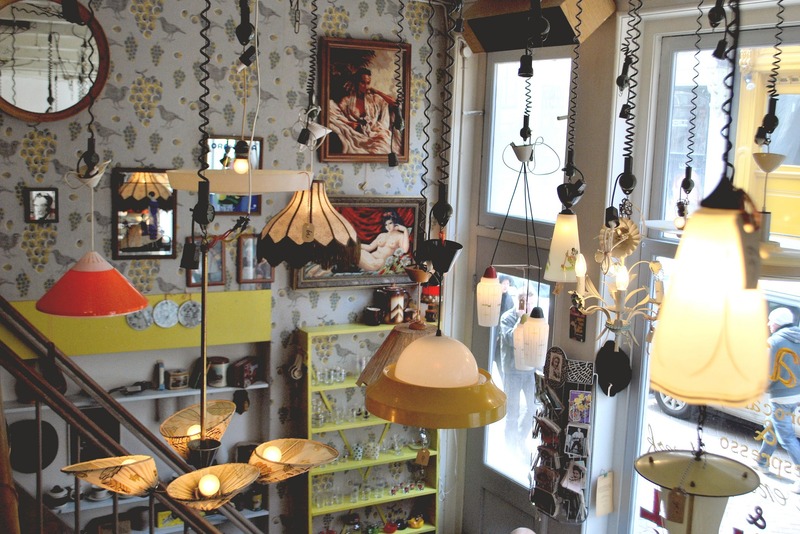 In the very center of Amsterdam, near Nieuwmarkt, you will find a cozy little place called Latei. It has a great feel to it the moment you step inside. You’ll be greeted by the friendly staff and shown a table, which you can also buy. Together with the chairs or, you know, one of the many lamps hanging above you. You get the picture: all the interior here (and there is a lot) is for sale. The food changes weekly, and there is usually one main dish and a couple of side dishes to choose from. Think Gado Gado (Indonesian vegetarian salad) or Rendang from goat meat (slow-cooked), but I’ve also had Ethiopian food here. The common denominator here is that it’s all truly delicious and affordable. On Thursdays, Fridays, and Saturdays the Kookkollektief takes over Latei’s evenings, where chefs Wanto and Paul create their famed delicious nutritious dishes. This restaurant has quite the bold concept. It’s ‘pay as you feel’ (not ‘pay as you want’ as I have been specifically told by the waiter) with all the free-spirited paraphernalia to go with it. “Believe nothing is too good to be true”, reads a poster on the wall. 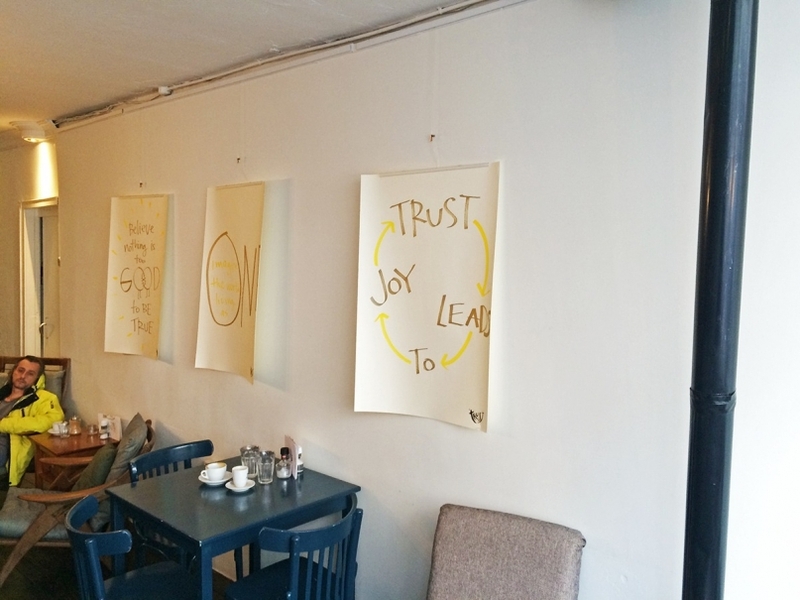 A few of the motivational posters hanging around restaurant Trust. The extensive manifest of the Trust restaurant; it coveys Love, trusting each other and sustainability (and good food). Love and Heart are spelled with capitals on the menu’s appendix, which as a matter of fact is more of a manifesto. Luckily it is still possible to order your food, and there is quite some choice. Soups, sandwiches, desserts, coffees and some main dishes, it’s all there. Meat is a no-no, however, as all dishes are vegan. 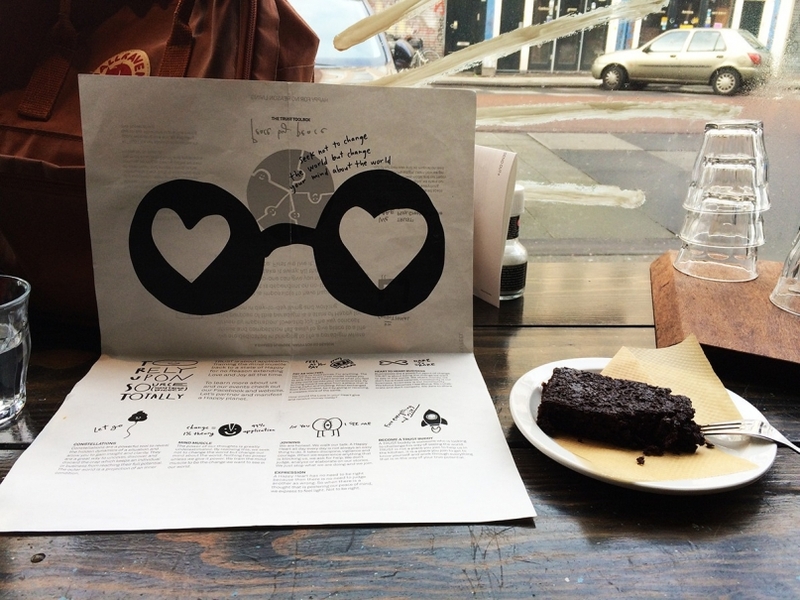 Trust’s menu, free water station and the delicious brownie I ordered. I ordered a Tom Tom soup, basically a vegetable-rich Tom Kha Gai soup without the chicken. To savor my sweet-tooth I order a coconut-pecan brownie. Both dishes turn out to be delicious, and the singing chefs (I don’t think it’s a thing) complete the extraordinary food experience. 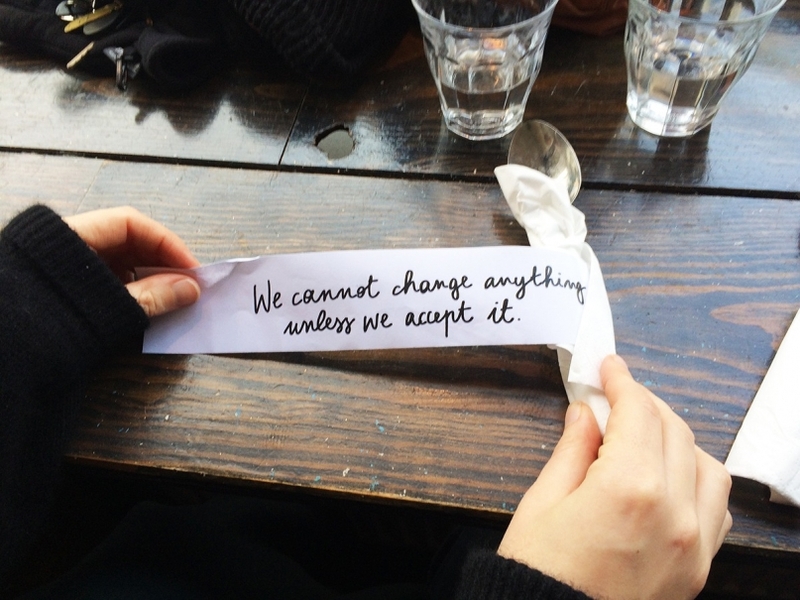 Trust’s version of a fortune cookie: a words-of-wisdom cutlery wrapper? The front window of the restaurant makes it clear: this is not just your average hipster restaurant. These guys are trying to convey their morals in every way they can. Tom Tom Soup — € ? Pecan Coconut Brownie — € ? Located next to the main road, this place doesn’t really ooze accessibility. 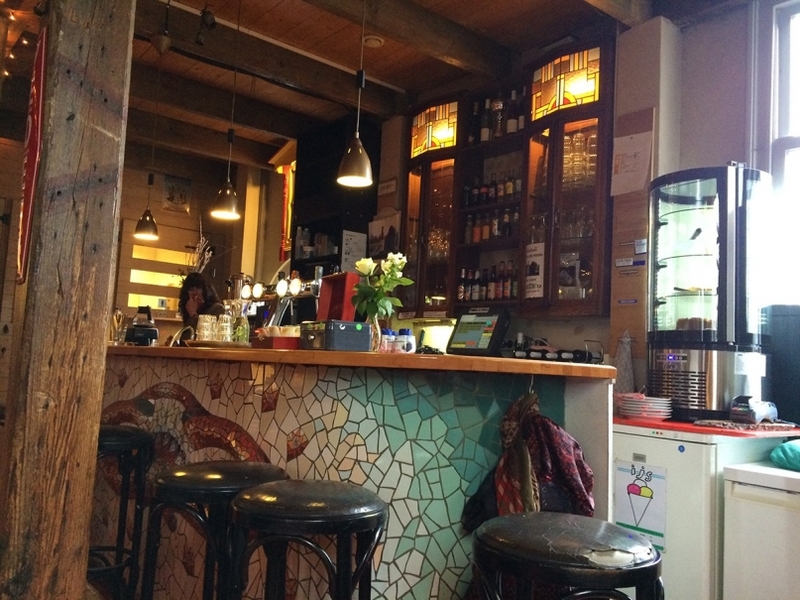 Nevertheless, it’s a hidden gem in Amsterdam’s food scene. The Bosnian, Serbian and Montenegrin staff are super kind and the general vibe in this small place is homely and friendly. No wonder they called the next-door restaurant, which shares the same owner, “Friends”. During practically every visit one or more of the chef and owner’s many friends drop by for a little chat. It’s the ideal place to work in my opinion: their wifi is fast, the coffee is good and there are power plugs available. I haven’t mentioned the best part yet: their food. A friend of the owner chatting away. 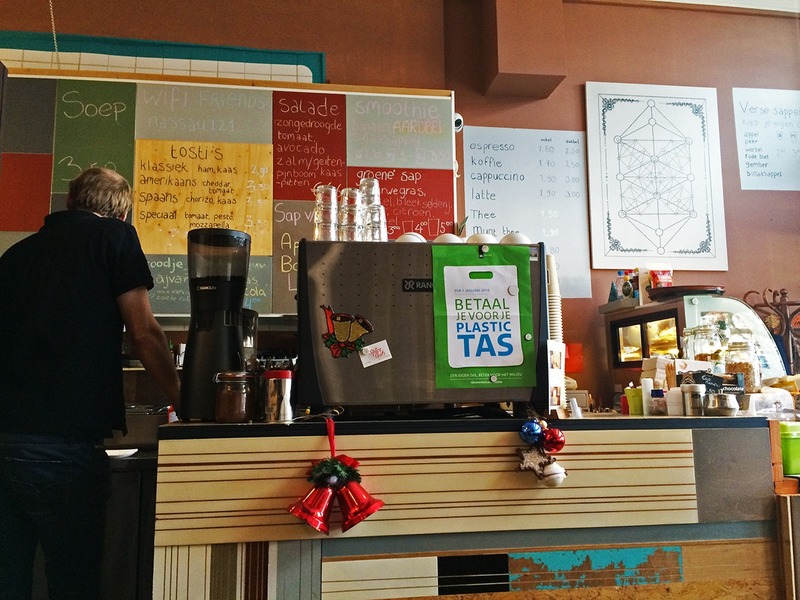 This is a very common sight in this cafe, and I like it. 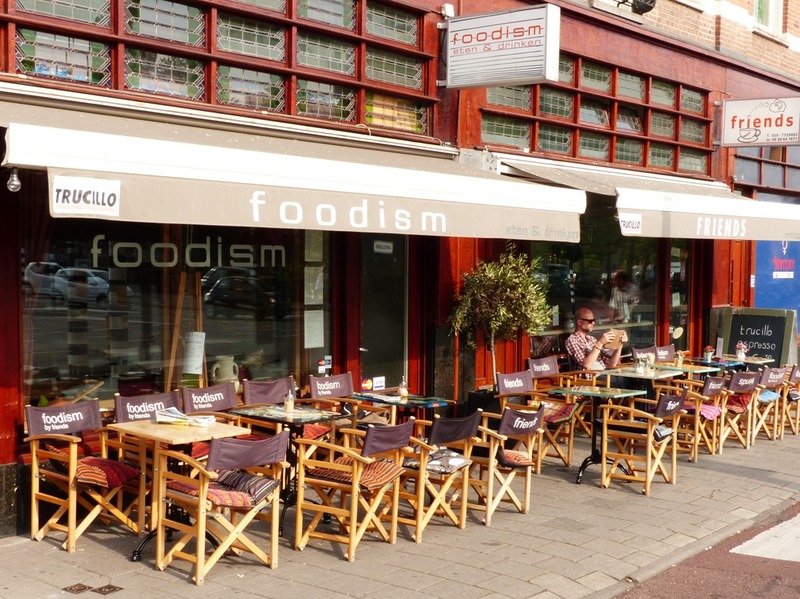 One afternoon when I was on a mission to re-discover Amsterdam’s “Oud-West” neighborhood I found a review on Foursquare promoting Foodism. “Great place, be sure to try their salmon salad”. I found the place, sat down and ordered the salad. To be completely honest, I haven’t tried any of their other dishes yet: the salmon salad is just too good and I order it every time I visit. Just look at it! 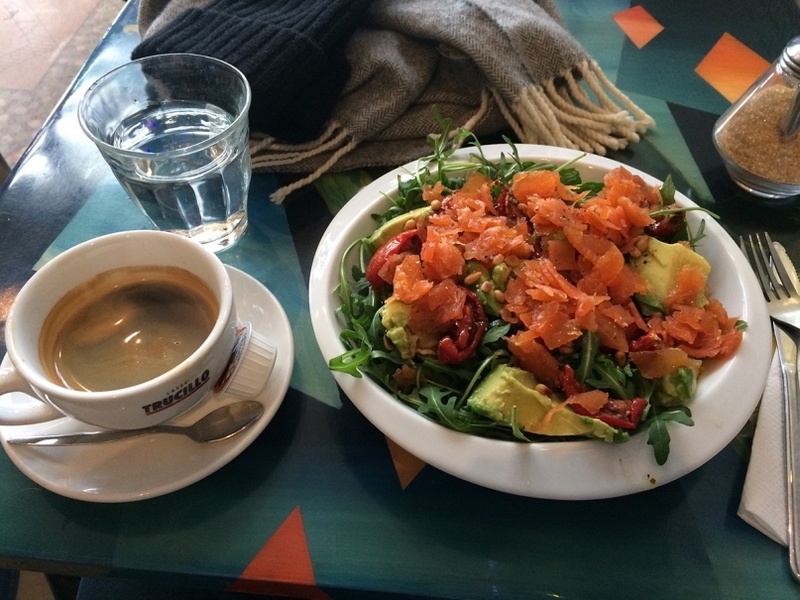 Do not leave Foodism before you’ve eaten the salmon salad. I’m pretty sure the staff must call me the salmon salad man behind my back, but I don’t care. I really enjoy it when food places do one thing well, and Foodism definitely falls into this category. Only downside? They don’t have their own bathroom, so you’ll have to pop into the “Friends” cafe next door. With it’s extended opening hours (every day from 11:00 till 21:00 or 22:00) this fancy pizza place can be a great go-to place if you’re in the neighborhood and craving lunch, dinner or just a quick snack. Don’t let looks fool you though, as you’ll definitely get your money’s worth here. 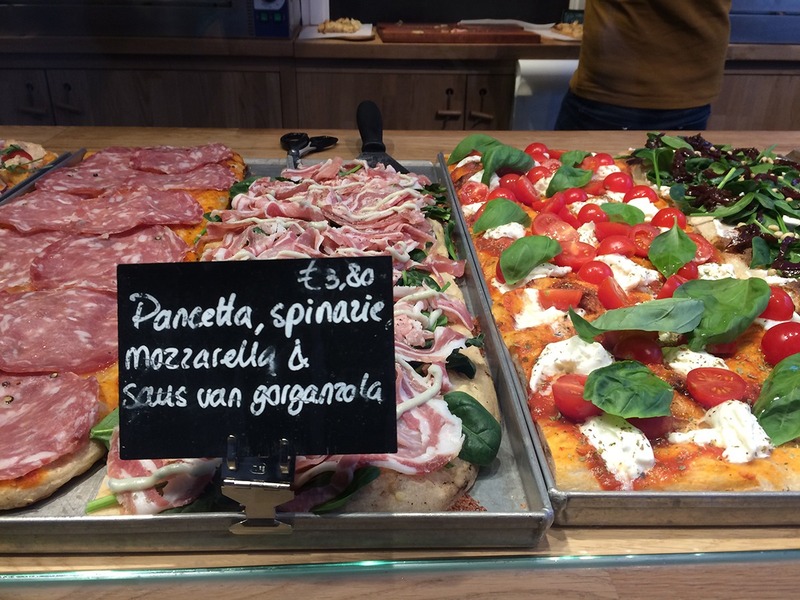 A (square) slice costs around €3 – €4 and is freshly made throughout the day. 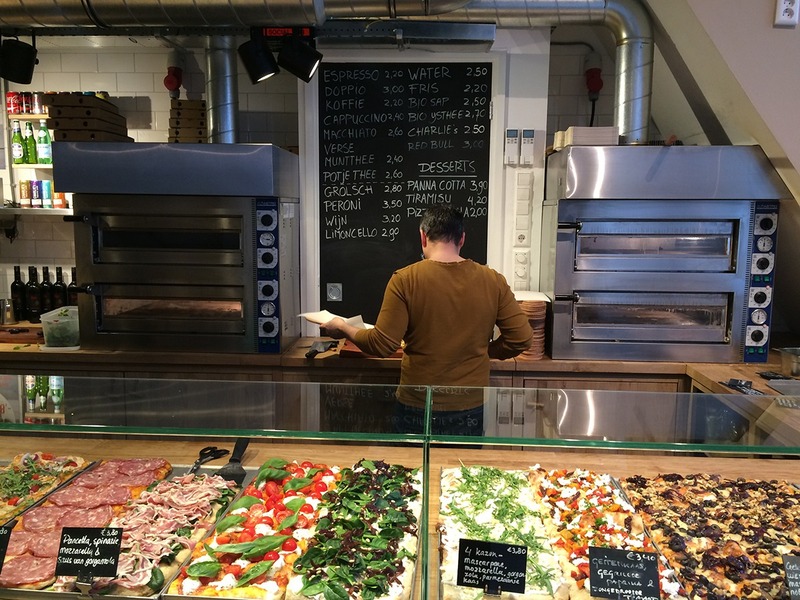 The concept comes from Rome, where you can find plenty of “Pizza al talgio” (meaning “pizza by the cut”) which are cooked on large rectangular trays. 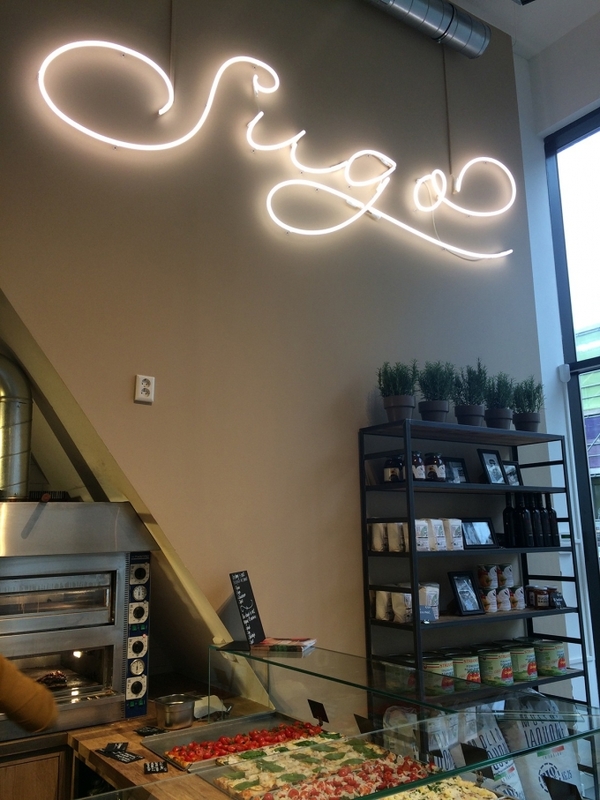 Sugo’s interior is very photogenic with its indirect lighting and large windows, so I didn’t even have to edit the pictures to make them look good. What more is there to say? 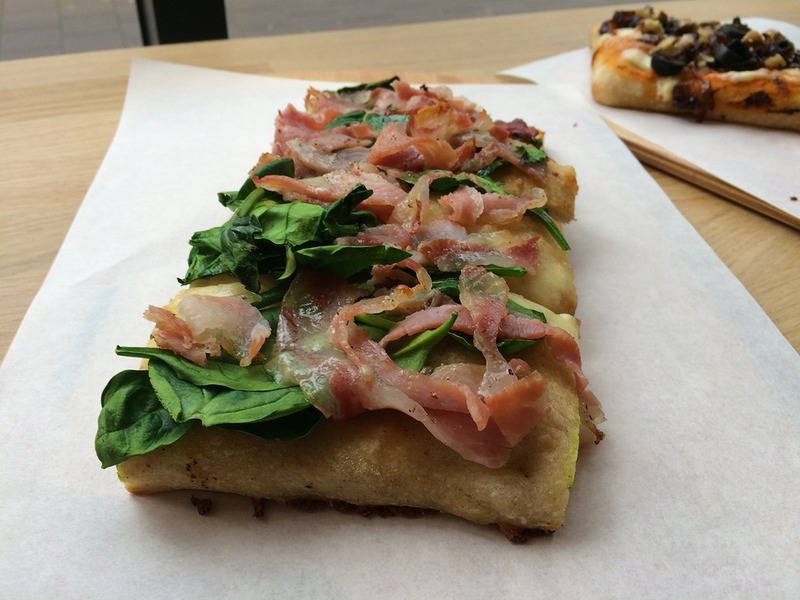 I chose a slice with pancetta, spinach mozzarella & gorgonzola sauce, and it was absolutely delicious. Have a look! Pizzas are made fresh all day. Pancetta, spinach, mozarrella & gorgonzola sauce. Yum! 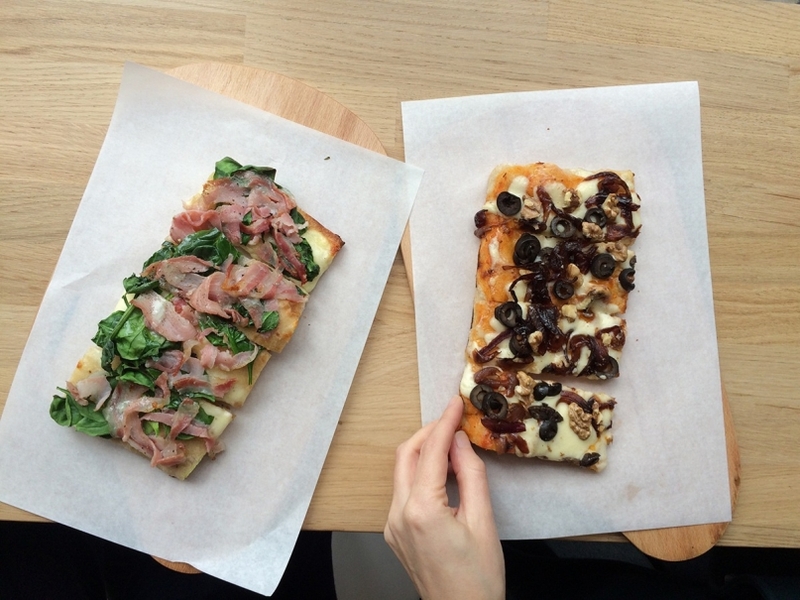 The pizzas are made with a special kind of dough that has 80% less yeast, making it all light and crunchy. Just look at this succulent slice and tell me it’s not mouthwatering. 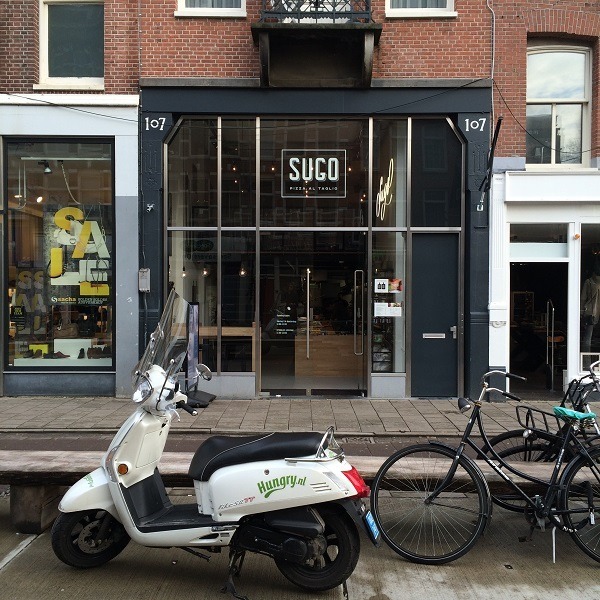 If you’re looking for a glitch in the Amsterdam food scene I nominate this place. Its prices are astronomically low; you get an Americano for €1.50 and a proper sandwich for €3.00. We’re not talking cheap white supermarket bread with shabby cheese on top, the sandwich I had was decent-looking and good-tasting. The dinners are even better valued: a three-course meal is only €8.00 and on Wednesdays and Fridays they even lower this to a mere €5.00! The sandwich and coffee I ordered. Mature cheese with caramelized onions and rocket. Not bad, eh? Certainly not for €2.75! Another good aspect of this place is the atmosphere. It’s completely non-pretentious, with a crowd of old and young. If anything, I would call it a little bit on the bohemian side. In the driveway to the farm, for instance, there is a giveaway shop where all things are free for the taking. The motto is: “Take what you want, but when you have some things that you’d like to get rid of, think of us”. If you really want to calm down and get out of the rat-race driven city center, this is a great place to do so. What’s a farm without livestock? 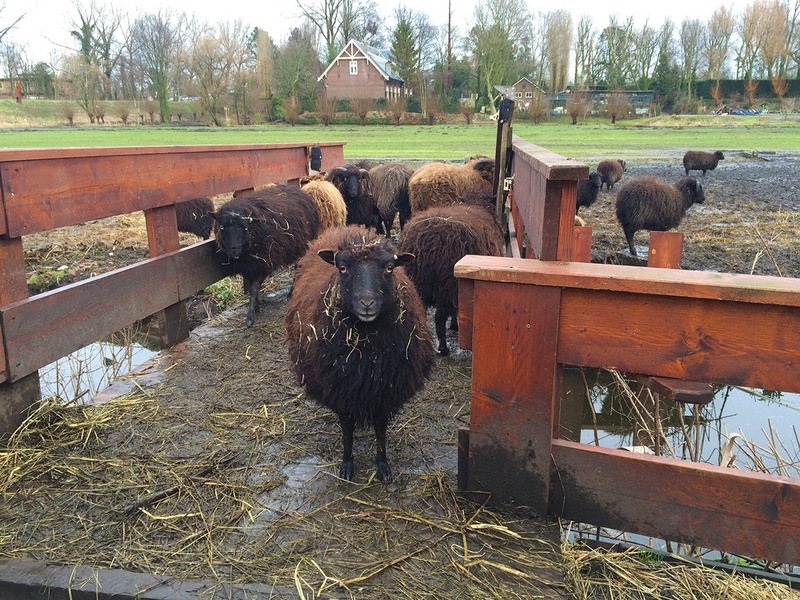 There are some wonderful (adopted) sheep roaming around the nearby acre. All in all, I find this a brilliant place to visit in the summer or whenever the sun decides to show itself in Amsterdam. The best way to visit the place is by bicycle, but you can also take bus 22 from central station which takes you there in about 20 minutes. You will find that the farm is a bit hidden, so make sure you punch the address into Google Maps before your journey. A nice way to end your day would be to stroll around in the nearby Westerpark. I love Thai food, but then again who doesn’t? I built up quite a high tolerance (and addiction!) for spicy food during my stay in Thailand. For me the more chilies the better. Back home in Amsterdam, I started a quest to find the most ‘authentic’ Thai flavors. Of course, there are plenty of haute-cuisine-type restaurants that get it right (and many who don’t), but I wouldn’t be writing this if my recommendation wasn’t well within a modest budget too. 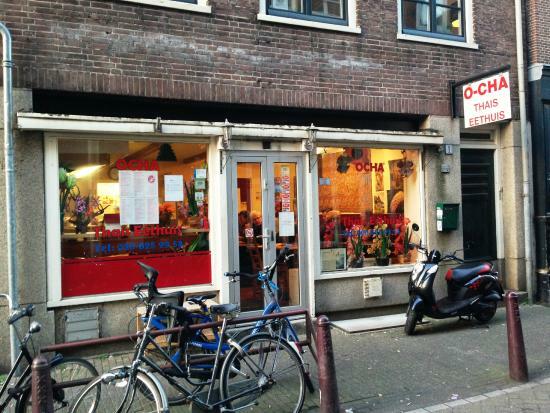 I present to you: Thai restaurant O-cha, located in the touristy Nieuwmarkt area. It doesn’t look like much from the outside, and even on the inside the interior isn’t the main attraction: a couple of Thai flags, carpets and posters are stuck on the wall. 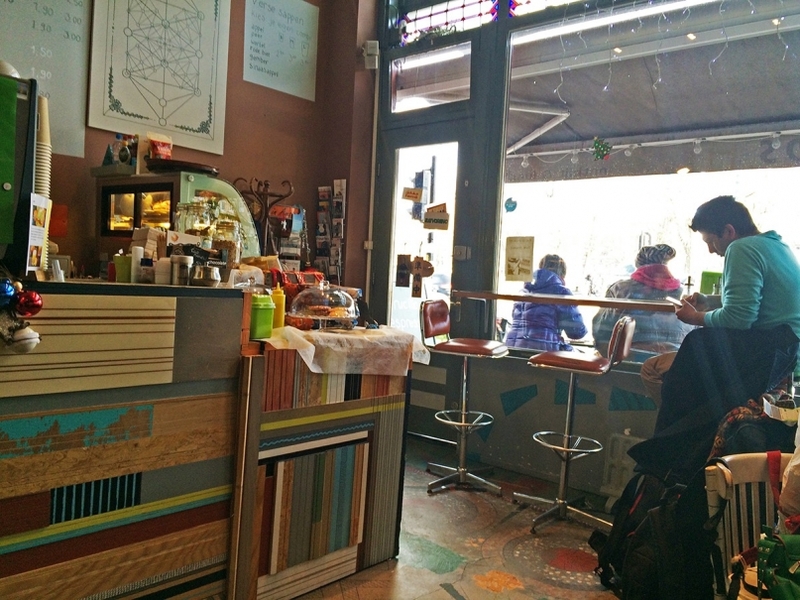 The place is small and tables are arranged in a Tetris-like fashion. 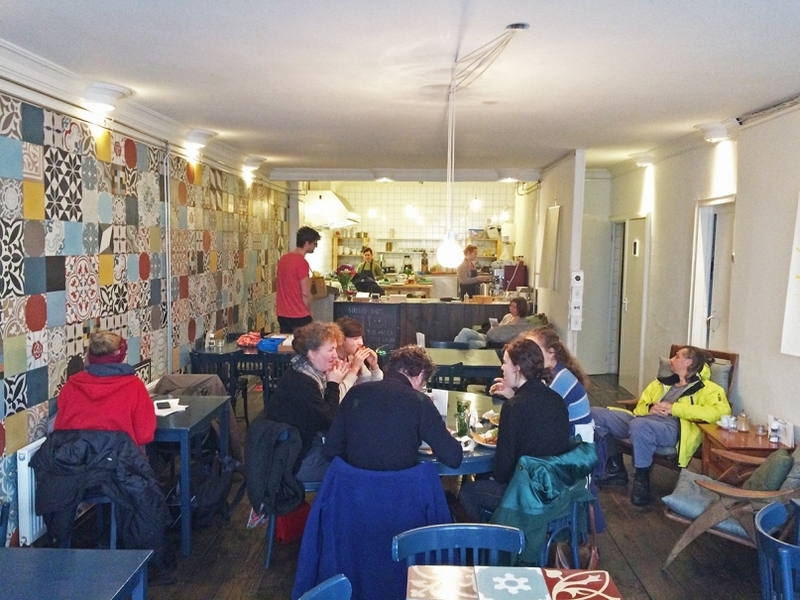 This does give the place a cozy atmosphere: people and food are clearly put above anything else. 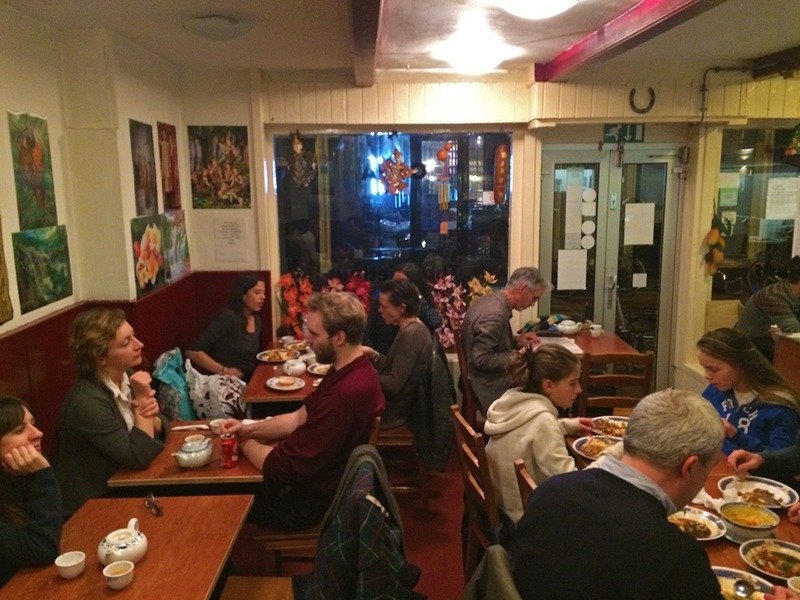 The staff is as authentic as the food: the typical Thai-style way with (English) words makes you feel welcome and jolly. I order a Phanaeng peanut curry, a self-proclaimed stamp of approval for Thai restaurants I visit. I take a bite and automatically start nodding my head in approval: this is good. 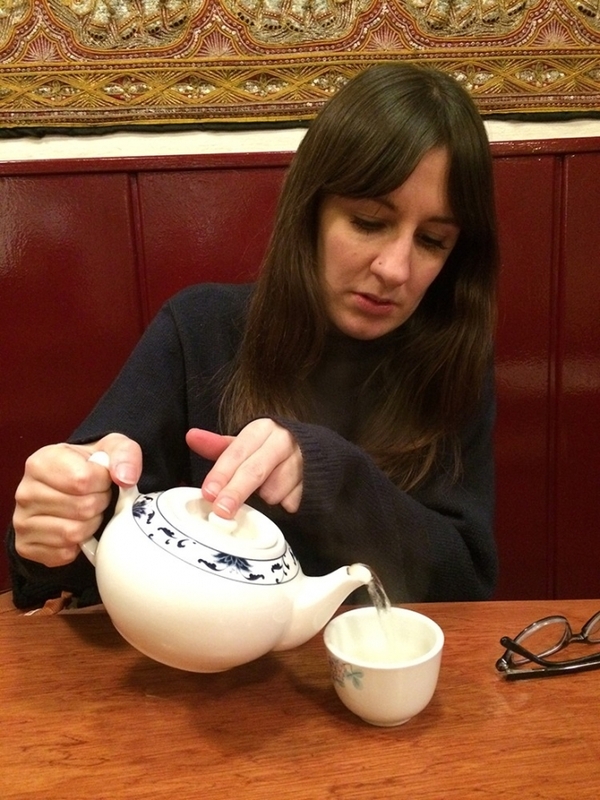 The pot of ample jasmine tea is a very nice addition to the rich flavors of the main dish. After a most satisfying meal, meanwhile listening to the funny conversation of the group I was sharing a long table with, it’s time to ask for the bill. The figures on it give me a second round of satisfaction: I’ve stayed well within my budget. 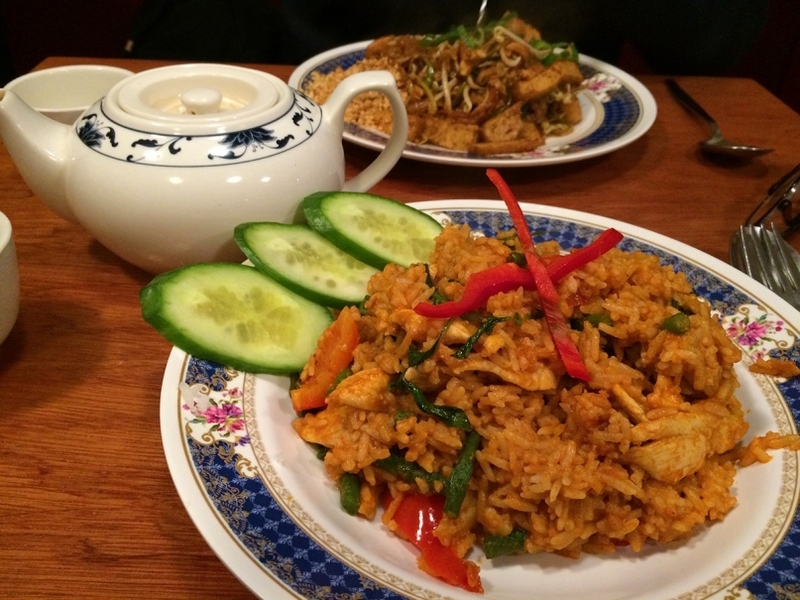 If it’s Thai food you’re after, try out this gem of a restaurant which comes highly recommend. 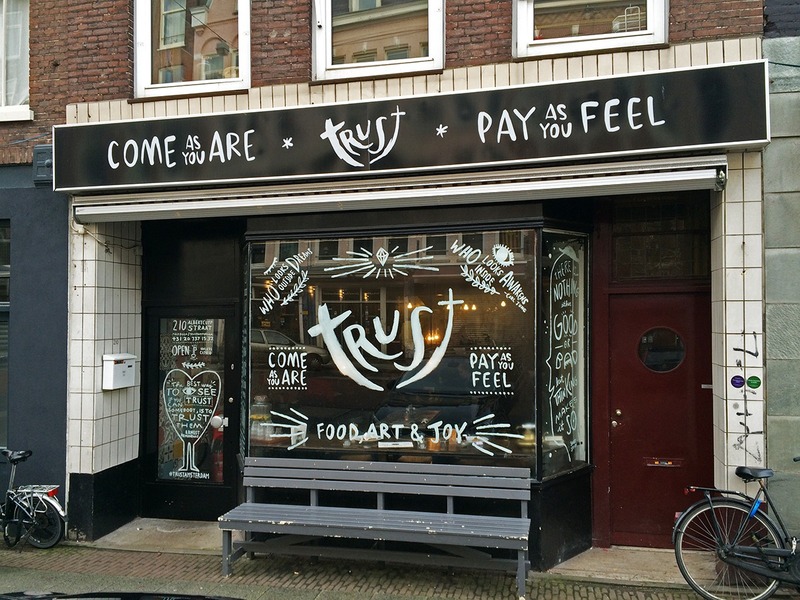 This is one of my all-time favorite restaurants in Amsterdam and the perfect combination of tasty food on a budget. The place has recently gotten revamped, but luckily their and the staff didn’t change a bit. You’ll see an awesome mix of people here, from suited businessmen getting a quick take-out to retired immigrants enjoying a slow meal with their families. The place isn’t big, but you will most likely find a seat if you don’t go in prime-time hours (6pm – 7pm). 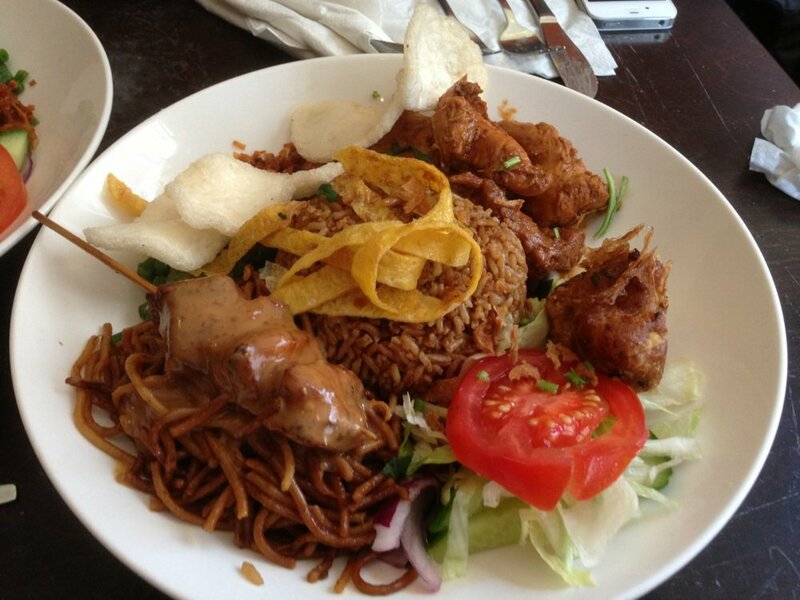 The cuisine is Surinamese-Javanese, a combination often seen in Amsterdam. Chicken sate. It’s all about the sauce here. Even more than the saoto soup, lots and lots of restaurants and takeaways in Amsterdam have their own peanut sauce. Some are a bit spicier, some a bit runnier, some a bit more peanutty than others. I think Warung Mini got it exactly right. Baka bana. Meaning “baked banana” in Surinamese, and that is exactly what it is. The banana is baked with a crunchy layer of breading and is served with sate sauce (peanut sauce) and is an absolutely lovely side-dish or dessert. 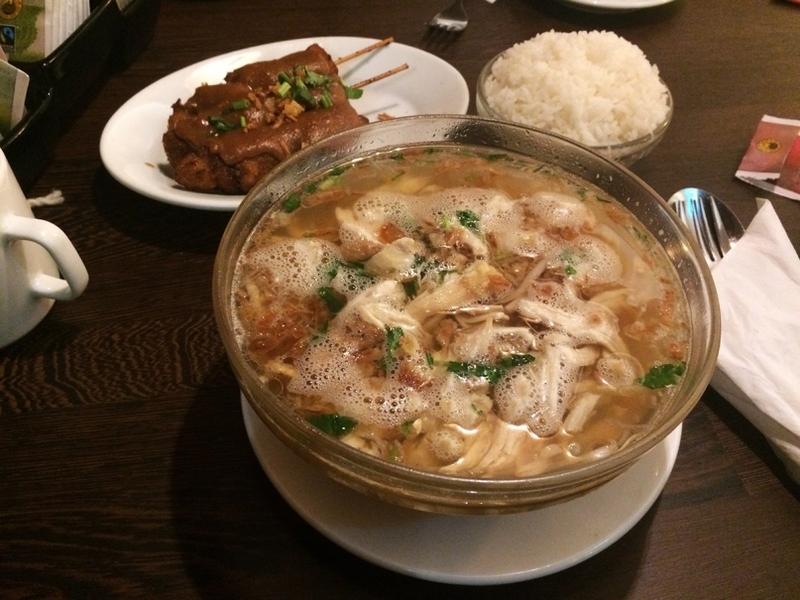 The saoto soup and chicken sate. It has almost always been my first meal when I get back to The Netherlands after traveling. The Japanese-style restaurant Taka is by far the quirkiest place to eat in Amsterdam that I’ve come across. It really makes me think back to my trip to Japan where it is normal to advertise restaurants using cartoon characters or caricature style drawings of the chef or staff. Check out their Facebook page posts to see what I mean. 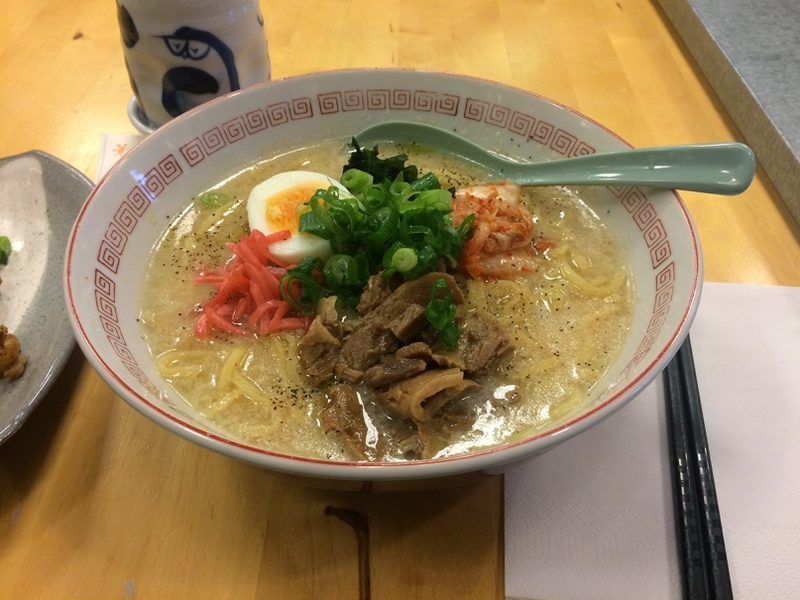 Going for lunch at Taka is a whole experience, in every way you can imagine. First, you’ll have to find the place. 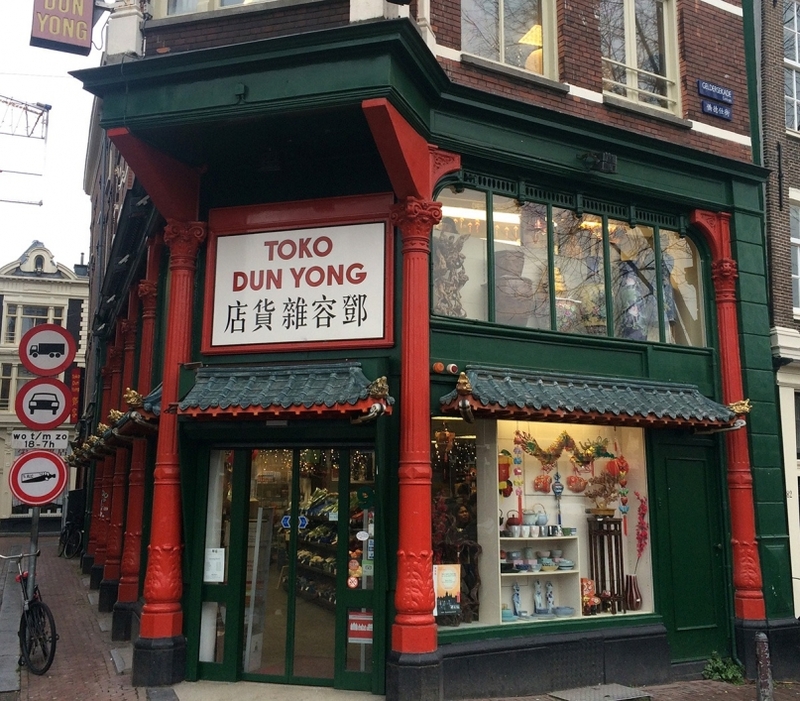 If you follow your Google Maps app, you will end up in an Asian supermarket in Amsterdam’s Chinatown. 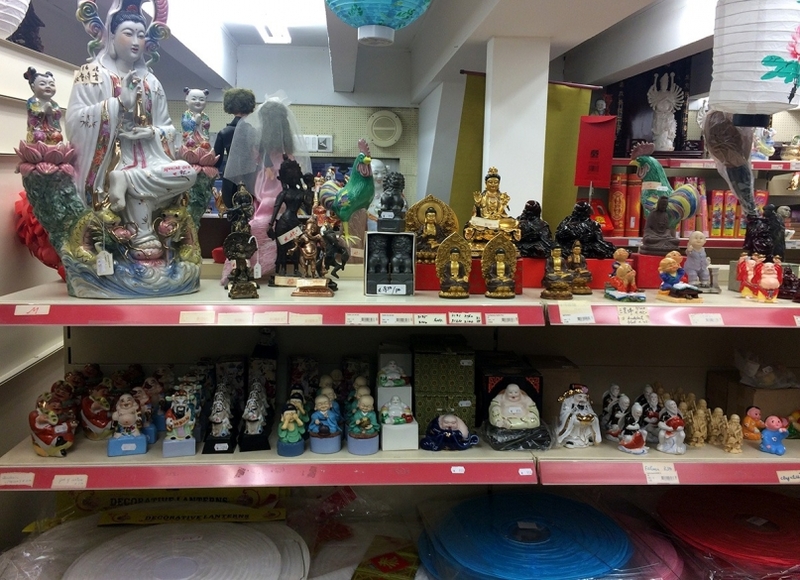 Fear not, it is the right address, and you will have to go inside the supermarket and take the stairs to the second floor, past a whole lot of Chinese paraphernalia. Exit through the gift shop, kind of. The place is only open from 12:00 till 15:00 (closed on Monday and Tuesday), but if you arrive after 14:00 there is a chance that they run out of ingredients. There is practically always a queue of at least a few people, and it’s gamble to determine how long it will take before you will get a spot. 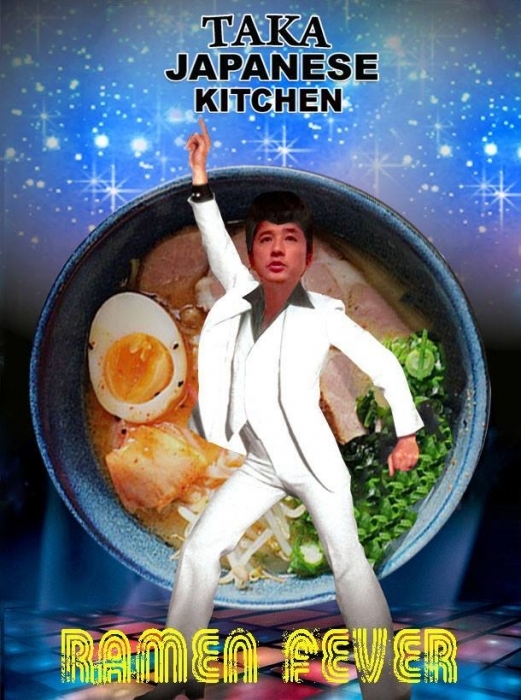 One of the two chefs that ran the kitchen of Taka like a well oiled machine. 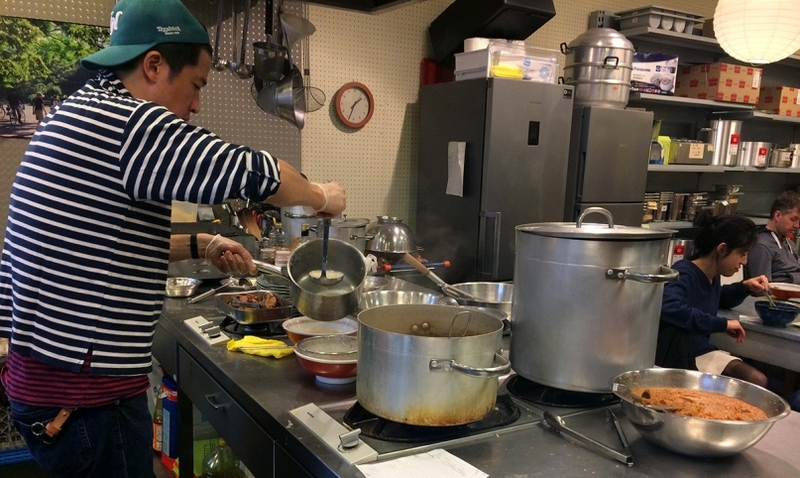 There are two hard-working young Japanese chefs in the open kitchen, located in the middle of the seating area. You can definitely tell that they are not wasting any time chatting, and the waitress (singular) brings the dishes over as soon as quick as she can. Another time that stood out during my visit of Taka was the mixture of people that were there: a posh elder Dutch couple, a hip-looking young couple speaking English, two Asian-looking girls, a dark-skinned teenage guy with a mustache and a beenie. I love how unpretentious this place is, and that they focus what’s most important: the food. I love a place that does only a few dishes but does them well. Taka is such a place in my opinion. 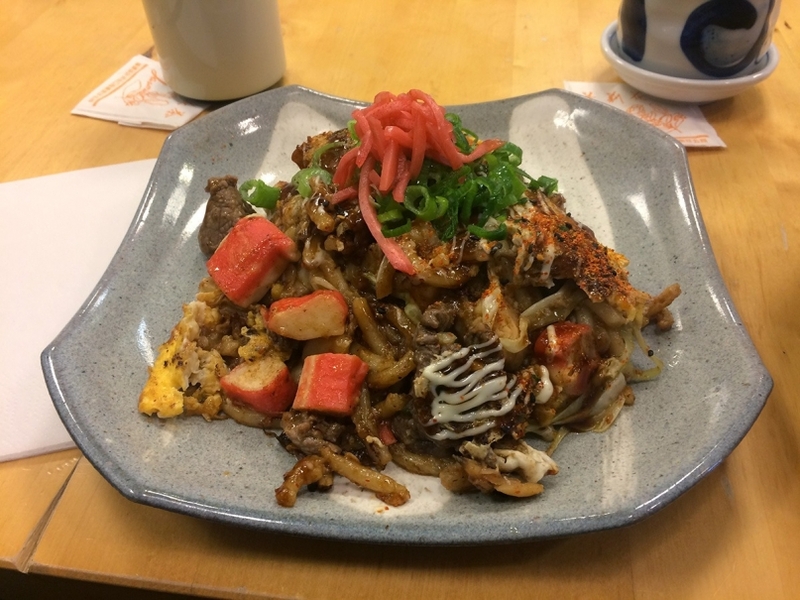 Having tried some pretty amazing ramen noodle soup and okonomiyaki (a Japanese-style pancake) in Japan, I knew what the original dishes could taste like. 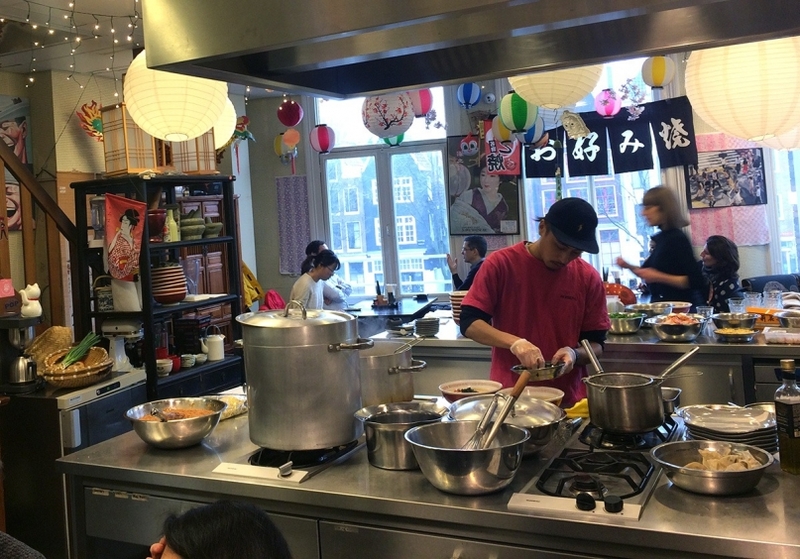 There are quite a few Japanese restaurants and sushi places in Amsterdam, and they are mostly upscale places that come with a hefty price tag. The people at Taka, however, found a way to make Japanese food for a very reasonable price. And not just your average food, the ramen, okonomiyaki and gyoza my girlfriend and I had were simply top notch. The flavors and even the way the food looked definitely reminded me of the amazing Japanese style of cooking. This restaurant comes highly recommended and you’re missing out if you haven’t tried it yet. One thing I really miss in the Amsterdam food scene is a personal touch in the more “hip-looking” food places in Amsterdam. 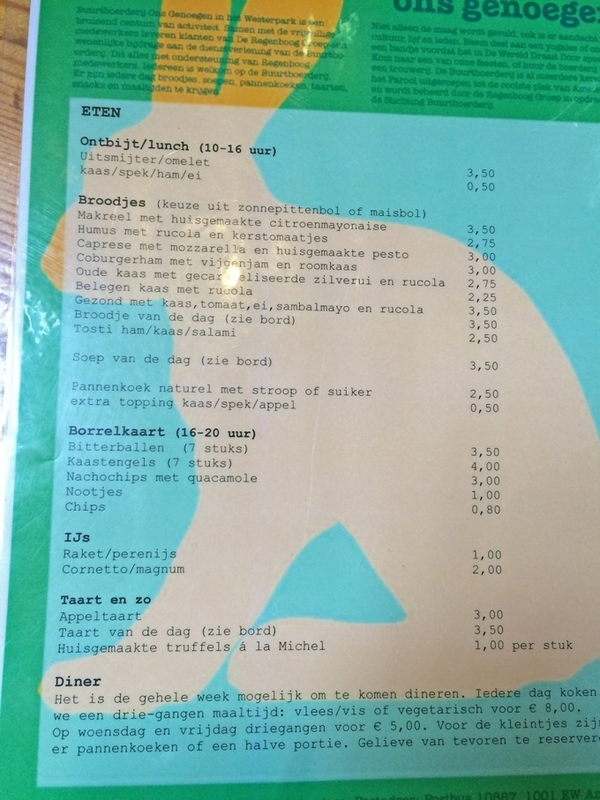 Usually, your food gets delivered to you by a groomed young waiter/waitress with a quick “eet smakkelijk” (enjoy your meal) without real meaning. Seldom you will be able to talk to the owner or chef to see what inspired him/her to start the place and choose the meals they serve. 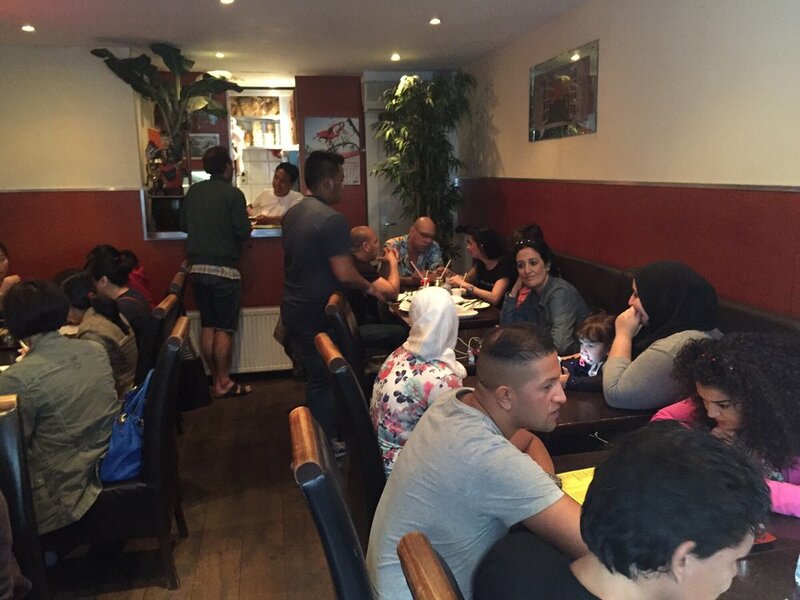 At Selma’s, you can feel that welcoming vibe straight away. 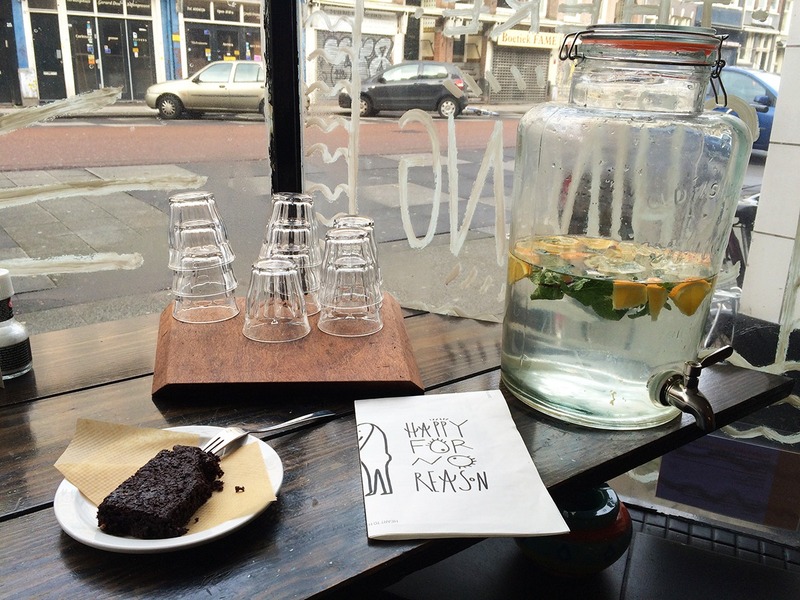 The place is a passion project by a lovely Dutch/Swedish couple called Jorrit and Anna. 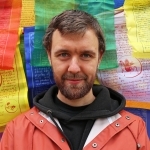 Jorrit worked as a music festival organizer when Anna floated the idea of getting back into the business of food. 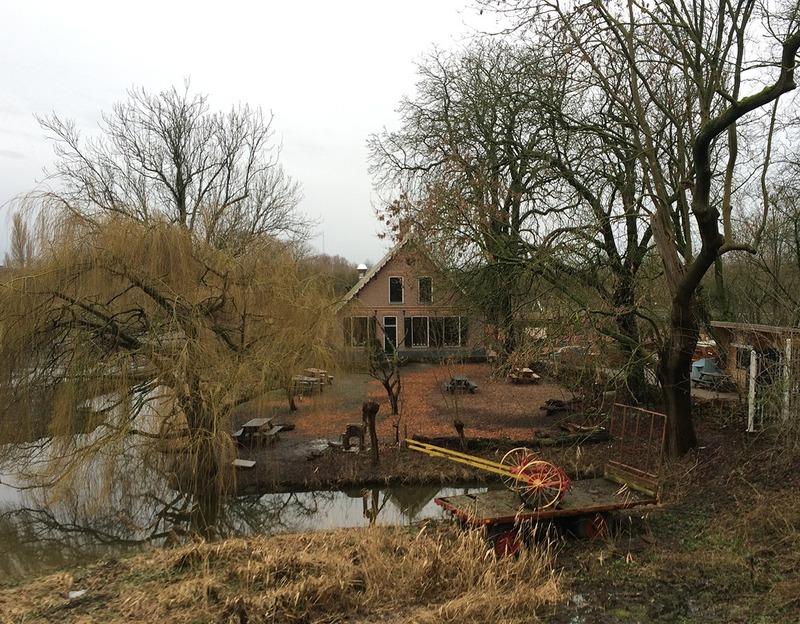 “Sure, but then we’ll start a restaurant on our terms”, Jorrit replied. And with that, the journey started. Founder stories are great, but can they match up to the quality of the food? Oh yes, they certainly can at Selma’s. 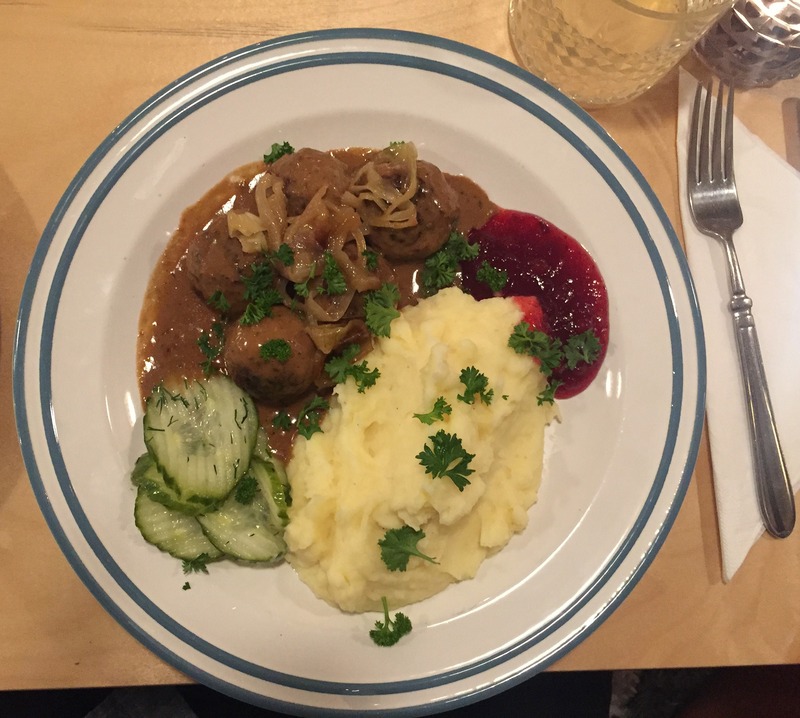 Even though the place is set up as a bakery cafe, as it closes at 5, they have started serving traditional Swedish Köttbullar (a traditional meatball dish, best known for being served at Ikeas worldwide). 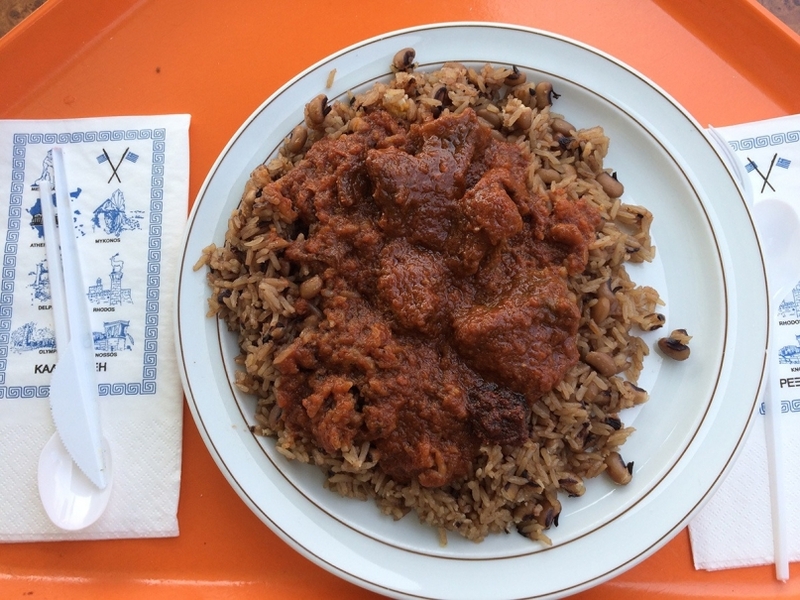 Having lived in Stockholm for a short while, I have tasted the dish on more than one occasion and eating it at Selma’s transported me right back to the good time I had there. Be aware that they only serve the meatballs once a week, on Fridays, which is when they stay open in the evening as well. 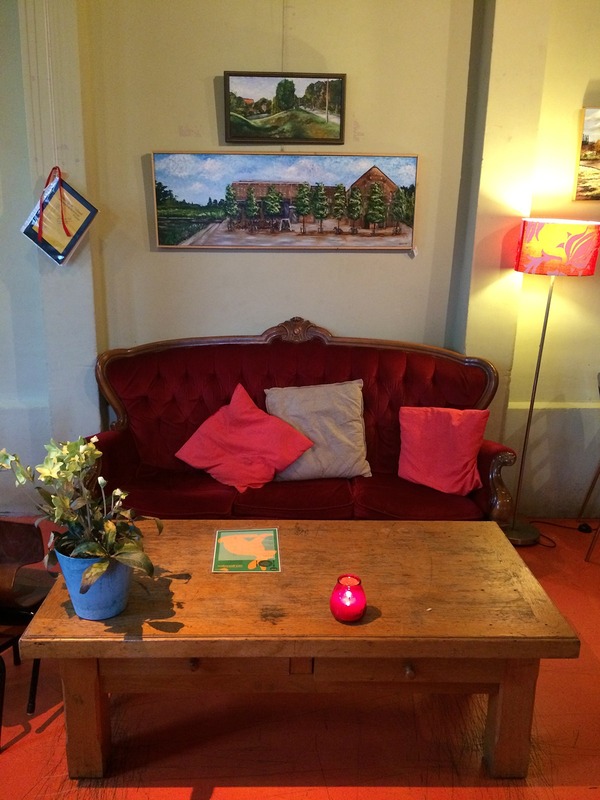 The place does great coffee (it’s a real passion for Jorrit) and even better baked goods, so you can chill there during the day as well as in the evening. 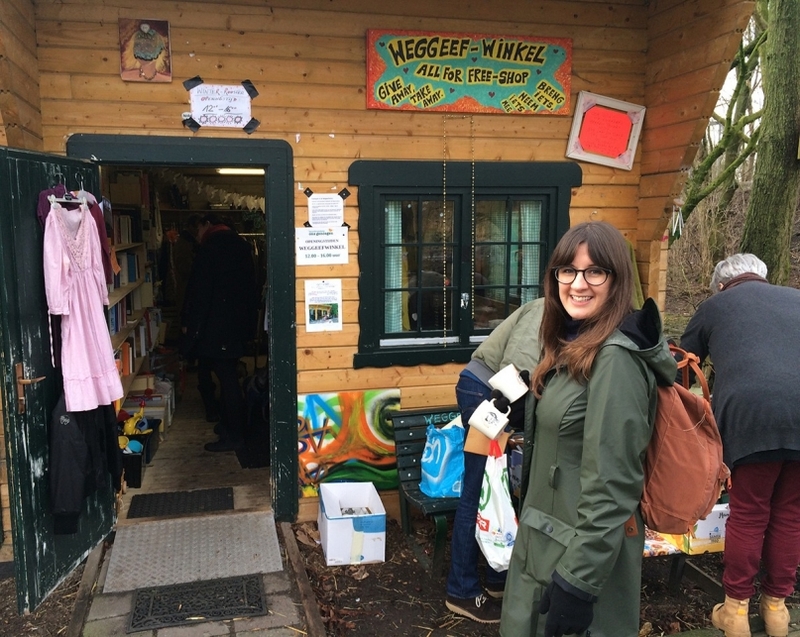 The best time to visit is during the week, as Saturdays and Sundays can be busy (just like everywhere else in Amsterdam, really). 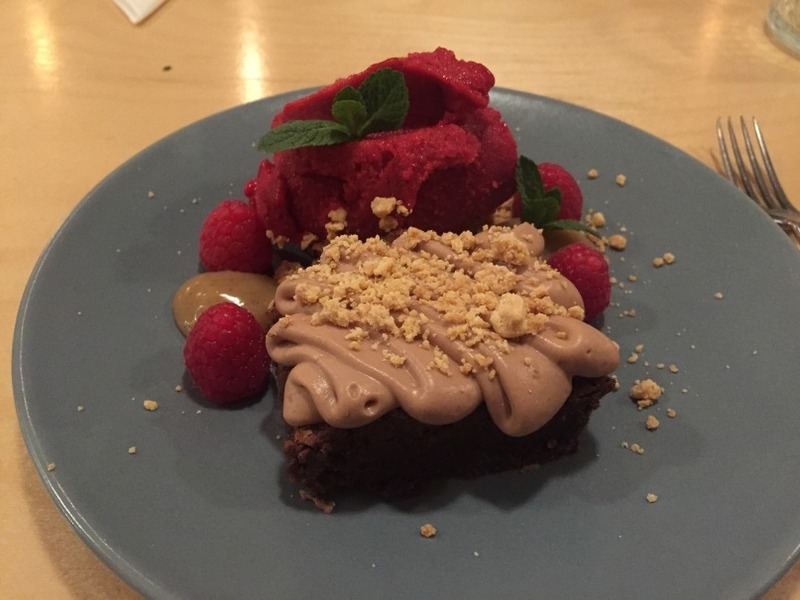 Delicious homemade raspberry sorbet and chocolate fudge brownie with caramel sauce. 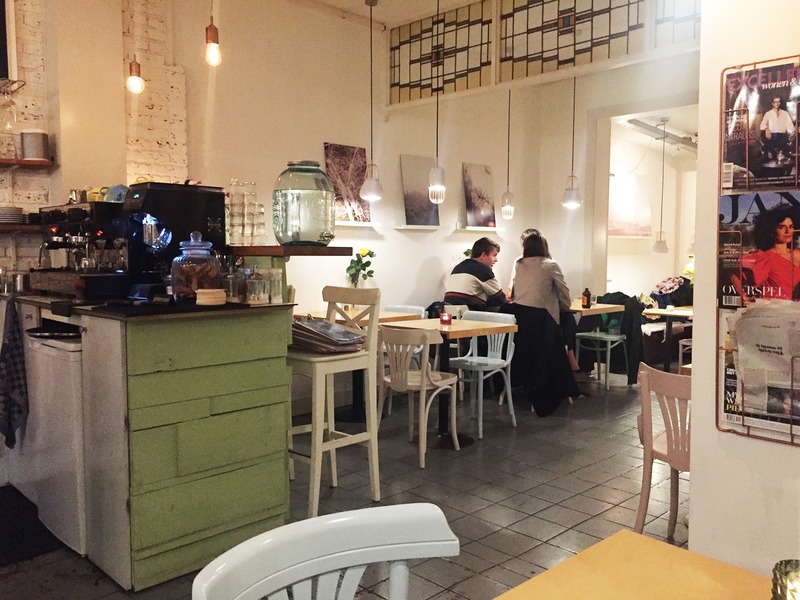 Although the price is just over our 15 euro budget, it is more than worth checking out this place if you are looking for quality, affordable food and a great night out. India, oh India. I have been there once, and it definitely left its mark. Not in a faux-spiritual kind of way, but more of an utterly confused but weirdly satisfying kind of way. At times, it was horror, getting from one place to the other with detours, scams and cultural oddities. But other times I would be surprised by the sincerity and generosity of the locals. One steady factor in all this was the food in India. Without fail, it was nothing short of being spectacular. I started my trip in Delhi with some amazing butter chicken. Then I went to arguably the food capital of India: Amritsar. The absolute highlight was the 7-hour food tour organized by Sanjay, the super enthusiastic owner of the Jugaadus hostel. 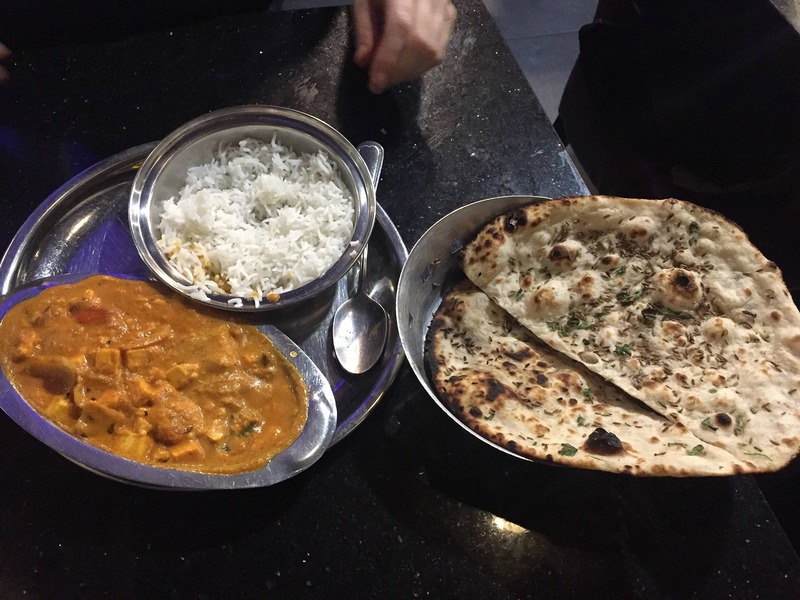 I often long for the delicious Indian cuisine, which is quite different than I have tried in any Indian restaurant in Amsterdam. Until I heard of Saravanaa Bhavan. This international chain (originating in Delhi) serves food that comes closest to the variety of flavors I tried in India; it also has that same chaotic vibe. The waiters are constantly running around, and the food is being served fast. Not once, but twice a cheesy and far-too-loud birthday song was played on the restaurant’s speakers. It was hilarious and transported me back to India for a bit. 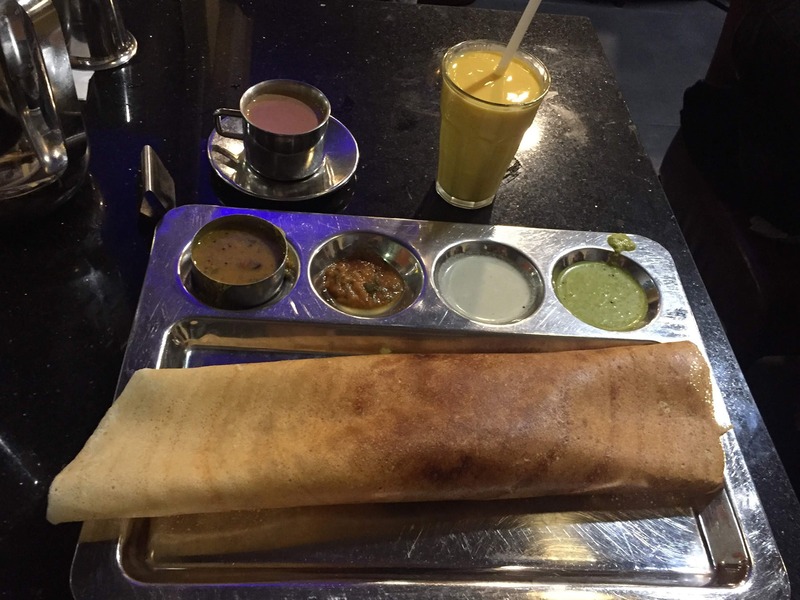 The food is excellent and varied, from Southern Indian dishes like Dosas to a Punjabi curry. All served on traditional metal plates. Indian food in Amsterdam has a sort of “premium” feel to it that comes with a premium price. Saravanaa Bhavan, however, keeps its prices low. Most dishes are around 10 to 15 euro. To keep things honest: this article holds one or more sponsored links, which means that I have received a fee to include these links. I do however make sure that the link(s) are relevant for you, the curious reader. If you have any questions or remarks, please do get in touch. Terrific list! The places I’ve already been to are excellent, so I look forward to exploring the rest. 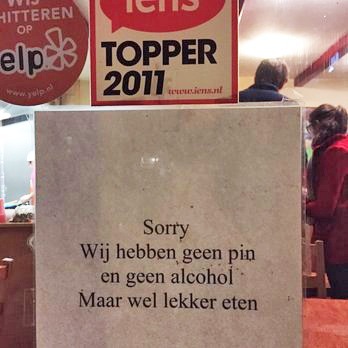 Hoi Victor, een goede lijst waar ik veel restaurantjes uit herken. Thanks voor de extra tips! 🙂 Ik ga ze eerst zelf even testen (field research noem ik dat) en dan zet ik ze erbij als de ervaring positief was. Roomrap Roti kende ik al, en die is zeker niet slecht! Ha, perfect! While I have a million suggestions for Istanbul, I never know what to recommend to my friends when they visit Amsterdam. I am missing the prices for each place though – would you have time to add those? I’ve added the prices, good point! Can’t wait to go to Amsterdam to try these places out! I can promise you that you won’t be disappointed! Cool article, haven’t tried these places (yet). The obvious choice of a good Chinese in Chinatown is ‘t mentioned, maybe because its too obvious. Thanks! 🙂 A good Chinese place isn’t mentioned because I hardly know any to be honest.. I know there are lots on the Zeedijk for instance but I wouldn’t know which of them serves quality (budget) food. Do you have any tips? P.S. Thanks for the Johannes van Dam correction!